Remember the Favorite Things gift exchange I attended last December? (If you don’t, it’s worth checking out!) One of the ‘favorite things’ shared at the party was the Whirley Pop. I was not the recipient of that particular gift. I filed it away in my brain as something to get one day. My 5-year-old Anna loves popcorn more than Orville Redenbacher, so I figured it would be fun to have around. …the verdict? We love the Whirley Pop! 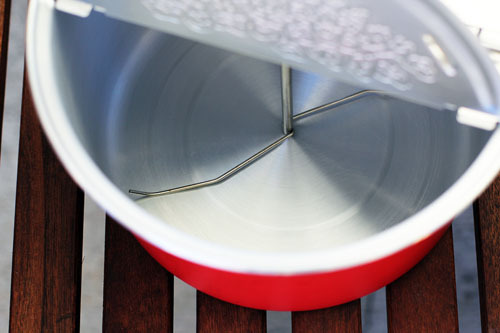 It’s a fast, easy way to make popcorn from scratch. It takes about as long as microwave popcorn but is completely free of scary chemicals. You cook the popcorn over the stove while constantly turning a crank, which keeps the kernels from burning. It works beautifully and the popcorn is delicious, fluffy and crisp! Parents, just so you know, kids get sick of turning the crank after about, oh, 10 seconds. You’ll end up doing most of the heavy lifting, but I’m pretty sure you can handle it. My friend Linda in the Bay Area is a fellow Whirley Pop lover and recommended Crown Jewel Popcorn as a great source for buying kernels. They have all kinds of gourmet popcorn to choose from, with pretty names like Blue Sapphire and Fiery Garnet. And, just so ya know, the Real-Theater popcorn kit that comes with your Whirley Pop…it’s not good. So, don’t waste your money buying any of those. Stick with straight-up kernels and then add your own butter! You can get the Whirley Pop pretty much everywhere: Whirley Pop’s website, Bed Bath & Beyond, Target, Williams-Sonoma, Amazon. Take your pick! And, for the record, even though this post sounds all pitchy, I have no connection to Whirley Pop whatsoever. We just love it and I wanted to tell you about it! When we make popcorn with the Whirley Pop, we do a full batch with 1/2 cup of kernels and 1 tablespoon of canola oil, topping with 4 tablespoons of melted butter when done, along with a sprinkle of coarse salt. Buttery and delicious! In case you were wondering, Anna is in popcorn heaven. UPDATE 3/16/16: Just wanted to give you an update that we have not made microwave popcorn since getting the Whirley Pop and use it frequently. Love it still, and it’s holding up nicely over the years. The lids on top aren’t quite as tight, but it’s not a problem. I never heard of this but I am SO getting it!!! I use to have a whirley pop and loved it! After having to scale down my kitchen appliances when moving to NYC, we ditched it. We now cook our popcorn in a brown paper lunch sack in the microwave- 2 minutes, super easy! (Google it). Also for delicious popcorn melt down coconut oil with just a TBS of butter; you will love it! Yes to the coconut oil! 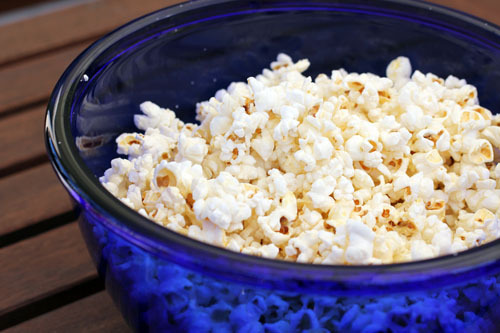 We use our whirly pop with coconut oil instead of canola and it makes such good popcorn! Even for my non coconut loving kid. You can also make a delicious kettlecorn by drizzling it with coconut oil and honey melted together and salt. Little sticky but so good. I really need to get this my girls LOVE popcorn 🙂 also LOVE that gorgeous blue bowl it is so pretty! I had one of these when I was a kid! And that was a long time ago! Not nearly as pretty but did the same thing. 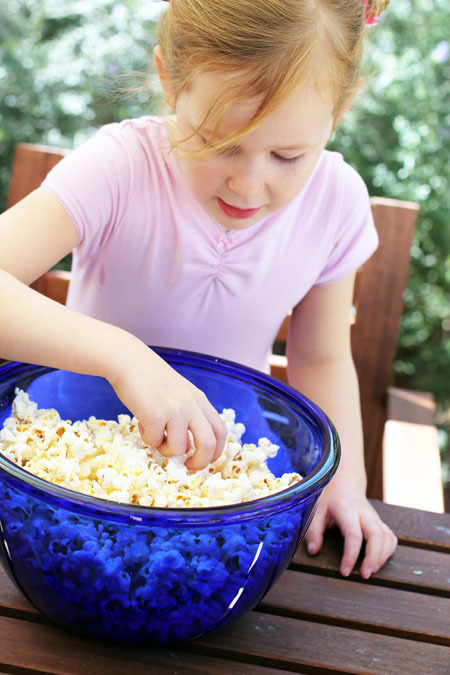 One of my favorite memories is hearing the popcorn popping for an after dinner snack to munch as we sit in front of the TV and watch our favortie shows together. Mom would then melt peanut butter and throw it all in a paper grocery sack and shake. On special nights we might get a handful of m & m’s or peanuts thrown in. Thanks for bringing that back for me!! I want one of those!! I’ve been popping popcorn in brown paper bags in the microwave to get rid of the greasy bagged popcorn but this… oh this looks like fun! I need one of these, too. I make so much popcorn, especially when the grandkids are here. And I like being able to control what goes into the finished corn. My husband’s life would not be complete without his Whirley Pop. When our original broke (out of sheer over-use, not a defect in any way), it was at the top of my list for his Christmas gifting. We love our healthier evening treat, using either 1 T coconut oil or grapeseed oil for popping, and topping only with herbs and spices. 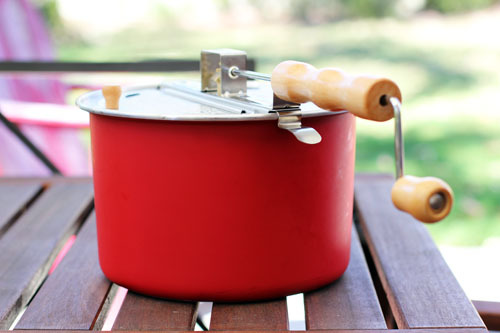 I love my whirley pop so much I too blogged about it and my favorite way to make popcorn. I love it so much I feel the whole world needs to know about this invention. Glad you are enjoying yours. I’m going to try your Ziti recipe, Jane. Oh how fun! I can’t make it the old fashioned way because moving the pot back and forth would scratch my ceramic cooktop. This would be perfect! you know I bet my girls have never had popcorn that wasn’t made in the microwave! i love this! I love my whirley pop. Have you tried honey butter popcorn? Just melt equal parts butter and honey, toss with popcorn and a sprinkle of salt. Addictive and delicious, but a tiny bit sticky. Yum. Is there a benefit of this over an air popper? I’ve only done microwave or air popper. it’s similar to an air popper for sure. from what I’ve heard salt “sticks” better to the whirly pop popcorn because there is SOME oil used when making it. if you have an air popper already and love it, then you probably don’t need a whirly pop. In a few years she will be willing to make it all on her own. We had a stovetop popper when I was a teenager (just over 20 years ago) and it didn’t matter if the parents were home or gone we made it ourselves. 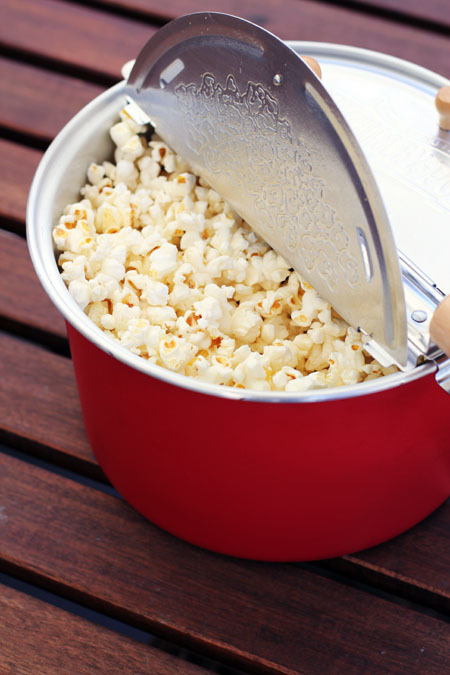 I want a popper for the stove b/c it uses oil, so the popcorn isn’t as dry as an air popper. As a sidenote: I bought Popcornopolis Nearly Naked Popcorn at Costco on a road trip. They used coconut oil & a hint of salt, I actually liked it better than buttery popcorn. So try the coconut oil. My 11-year old received one from her 13-year old brother for Christmas. It has been a hit, with popcorn making 2-4 times per week. Love how it pops faster and more completely than microwave in addition to being healthier. yes, I love how pretty much all the kernels pop and there’s no burning – it’s so great! I usually use a microwave popper but the Whirly Pop looks great. Is it possible to use less oil with it or to make a 1/4 cup batch? Also do you clean it each time with regular dish soap and water and either air dry or with a towel? Thanks. I know some people who just wipe it out with a paper towel each time they use it, which is fine to do – it sort of just keeps the pan seasoned. I personally hand wash it with soap and water and either air dry it upside down or dry it with a towel (usually air dry because I toss it in the sink with all the clean dishes I’m too lazy to put away).